Chas Wolfe’s annual Dunk-4-Diabetes could have easily been slowed down by the blizzard like conditions that plagued all of eastern Ohio over the weekend. However, almost all of the scheduled teams braved the elements, and ended up taking the court for nine exciting games in Canton at Walsh University. With Ohio teams being tasked with taking on national powerhouses like Huntington Prep out of West Virginia and Indiana prep team La Lumiere Academy, Triple Double Prospects got another chance to see some of the top prospects from the Buckeye State against truly elite competition. As college coaches from schools like Louisville, Ohio State, Michigan, Wisconsin, West Virginia, Dayton, St. Bonaventure, Akron and Ohio University looked on, several of Ohio’s finest stepped up under the big lights in Canton. 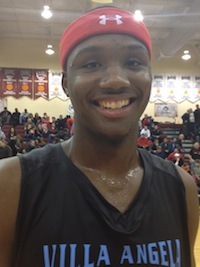 After two days of action, here are some of the players who’s performances stood out…..
Carlton Bragg – ’15 Cleveland VASJ PF: While many onlookers felt that Bragg did not have his best game, and they’re probably correct, the 6’9 junior still finished with an impressive 28 points in a win over defending Division I State Champions, Mentor. Ohio’s top ranked 2015 prospect shot over 50% from the field, and also knocked down 12/16 free throws. While we’d still like to see Bragg be more of a consistent rebounder, he did display his top-notch athleticism in running the court for blocks and dunks, scoring most of his points in the third quarter as VASJ looked to overpower Mentor athletically in the fast pace game. Recruiting rumors continue to swirl around Bragg, but Ohio State, Kentucky, Arizona, Kansas and Illinois are schools that are consistently mentioned by his camp. Derek Pardon – ’15 Cleveland VASJ PF/C: There’s absolutely no better complimentary interior piece in Ohio high school ball than Pardon, who like Bragg also stands 6’9. The rapidly improving junior finished with 13 points and 7 rebounds against Mentor, while only missing one field goal and zero foul shots. Pardon’s left-handed hook shot has become near automatic this season, and he has continued to show a keen understanding for where to be offensively. Last time we spoke with him about recruiting, Pardon mentioned offers from Kent State, Toledo, Akron and Cleveland State, as well as interest from various high-majors including Wisconsin and Northwestern. Johnny Davis III – ’14 Cleveland Beachwood PG: An often under-heralded point guard out of Cleveland, Davis might have had the most impressive stat line of any Ohio prospect on the weekend, as he put up 27 points (12/21 FG’s), 6 rebounds, 4 assists (1 TO) and 7 steals for Beachwood as they knocked off Peyton Aldridge and his Leavittsburg LaBrae team. A crafty guard who can change gears on drives to get by defenders, Davis is a skilled scoring guard with a nice stroke, but is also very comfortable as a distributor in the pick-and-roll game. He currently does not have a single college scholarship offer, despite being an academic qualifier, but could easily end up at the Division I level collegiately before the year is over. Derek Funderburk – ’16 Cleveland St. Edward’s PF: He doesn’t have the most prominent role on the St. Ed’s team, and actually doesn’t even start, but it would be tough to argue that Funderburk is actually the Eagles most talented player. One of TDP’s most highly ranked sophomores, the agile 6’9 power forward made an instant impact upon checking in on Sunday against Cincinnati Walnut Hills, finishing with 7 points and 7 rebounds on 3/4 shooting from the field. Funderburk has a skill-set that allows him to play from the short wing and attack the basket, where he has the beginnings of a triple-threat offensive game. Shockingly, Funderburk has just one Division I offer right now, from Xavier, but already as a sophomore the 6’9 forward has attracted interest from Michigan State, Iowa, Penn State and Ohio State. MaCio Teague – ’15 Cincinnati Walnut Hills SG: Teague continued his hot-streak from three-point line in Canton on Sunday, tallying an impressive 27 points, including going 5/7 from deep against Ohio’s top ranked team. A 6’3 junior, Teague is having a monster year in his first season with Walnut Hills. Compared to last season, Teague is not only physically stronger, but he also is more skilled at creating his own shot; which is important since when he has space to get it off his jumper is usually going to find nothing but net. Already with interest at both the mid and high major levels, Teague is a junior who is primed for a big jump in his recruitment after the season. LePear Toles – ’16 Canton Timken SG/SF: After impressing us on opening weekend at the Clark Kellogg Classic, Toles took his game to an even higher level in his hometown, dominating heavily favored Cleveland St. Ignatius as Timken pulled off the upset. Toles went off for 26 points (10/18 shooting), 5 assists, 4 rebounds and 3 steals in the game, including a steal and assist for the game winning bucket with less than two seconds remaining. A crafty lefty scorer with a smooth jumper off the dribble, Toles has the offensive potential to be one of the top wing prospects in Ohio in 2016; in what is already a loaded class. Toles already has an early offer from Ohio University, and has also attracted interest from several other regional mid-majors. Deven Stover – ’16 Cleveland St. Ignatius SG/SF: Another rising star on the wing in Ohio’s 2016 class, the 6’4 Stover has really made a name for himself in the last few months. Sunday, however, was his best showing yet, as the sophomore scored a career best 26 points. Showing impressive range in knocking down three long-balls, the ability to offensive rebound in traffic and the athleticism to be a finisher on the break, Stover combined production and potential to give the appearance of a very promising prospect in Canton. As his game continues to evolve, Stover looks to be a player who TDP will have a close eye on come AAU season. R.J. Jones – ’15 Huntington Prep (WV) PG: Since transferring to H-Prep from Cleveland Benedictine at the semester break, Jones has been trying to work his way into the rotation for the powerhouse prep team. In limited minutes in a 42 point win over Shaker Heights, Jones made his presence felt, knocking down a pair of triples for a Huntington Prep career high of 6 points. A prospect being recruited early on at the mid-major level mostly, look for Jones to use his experience at H-Prep to make an impact on the Ohio scene through the spring and summer when we see him next. Jalen Jackson – ’14 Warrensville Heights PG: Playing against La Lumiere Academy might intimidate some teams, but not Warrensville Heights. Led by their senior point guard, W-Heights took the game all the way down to the wire, before eventually falling, 57-54, to one of the nation’s top teams. Jackson had a special performance for his team on Sunday afternoon, going for 17 points, 3 steals and 3 assists on the game. Jackson is a capable shooter who can get by his defender and has a tough as nails approach despite being somewhat frail physically. A lesser-known but emerging guard in Ohio, Jackson has unquestionably become one of the better high school point guards in the Northeast portion of Ohio. 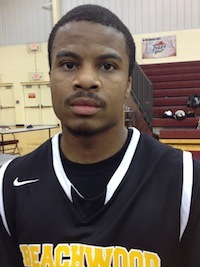 Bryan Gee – ’14 Cleveland Cornerstone Christian PG/SG: TDP had never gotten a chance to evaluate the Longwood walk-on commit before Saturday, and man was he impressive. The son of Longwood head coach Jayson Gee, Bryan Gee put on a show in the second half of his team’s win over Wadsworth in the first game of the day, finishing with 18 points, 8 assists, 7 rebounds and 4 steals in the win. An impressive defender and strong slasher, what impressed us most about Gee was the effort that he gave; part of which has us thinking that Cornerstone Christian will be a tough out in the Division IV State Tournament.